Perfect for fans of the Famous Five looking for their next adventure, The Adventure series has eight books in the series, starting with book 1, The Island of Adventure. All eight adventures are now available as audiobooks – click on the cover above to listen to a sample of book 1. The Secret Island was Enid Blyton’s first ever full-length adventure novel, and the fore-runner of the Famous Five. In the Secret Stories series, mystery always leads to adventure … and now you can listen to all four books in the series on audio. Click on each cover above to listen to a sample. Find out more about the Secret Stories here. 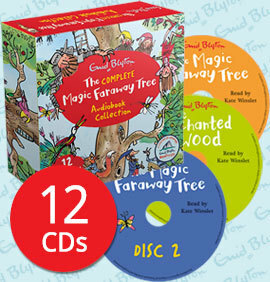 Read by Oscar winner Kate Winslet, this audio CD collection contains three of the four Magic Faraway Tree stories across 13 hours of pure listening magic. This set is exclusively from The Book People and is not available anywhere else! Find out more about The Magic Faraway Tree series here.